With only 6 ingredients and no baking required, these tangy goat cheese bites are perfect for any get-together. Recipe by Nutmeg Nanny. On a large platter, layout phyllo shells. Add prosciutto to a medium-sized skillet and set over medium-high heat. Cook for about 5 minutes to or until the meat is slightly crispy. Remove from the heat and let cool. In a mixing bowl add goat cheese, cream cheese, sliced chives and cooled prosciutto. With an electric mixer mix until fully combined. Fill each phyllo shell with an equal amount of filling (about 1 teaspoon per shell) and top with a fresh blackberry. Garnish with more sliced chives if desired. 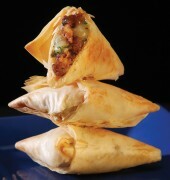 Sweet and smoky chorizo sausage and pepper jack cheese provide a perfect 1-2 punch in these flaky, Phyllo-crusted treats. 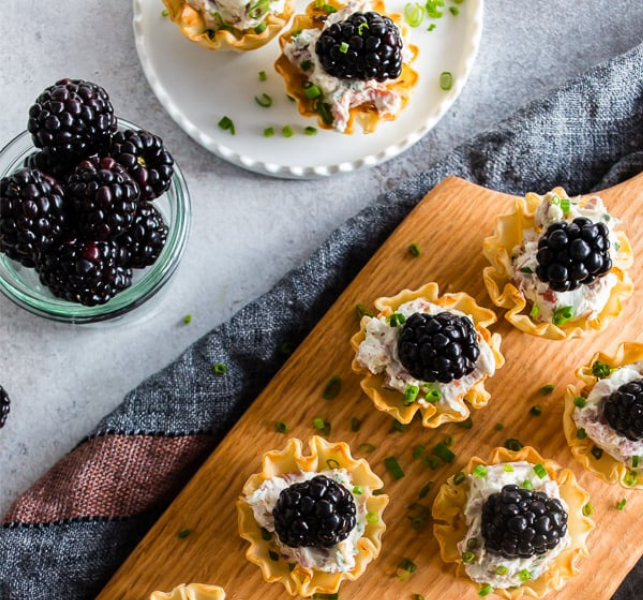 These flaky phyllo tartlets feature a citrus-flavored and honey-sweetened yogurt and sour cream filling topped with fresh berries and mint.